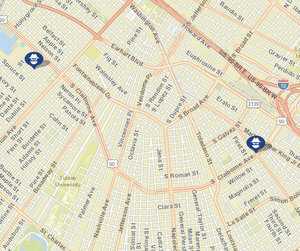 A man was beaten and robbed of his wallet while at a gas station Saturday on South Claiborne Avenue, and two women were robbed that evening on Dante Street in Carrollton, New Orleans police said. Shortly before noon Saturday, Sept. 8, a man in his 50s was pumping gas at a station on South Claiborne Avenue at Jackson Avenue when a juvenile suspect tried to take his wallet from his back pocket, according to the initial NOPD report. Several other assailants joined the fight, but then other people came to the man’s aid and the attackers left, the report states. Around 10:45 p.m. Saturday, two women — one 18 years old and the other 21 — were getting into a parked vehicle at Dante and Sycamore streets in Carrollton when a stranger “pushed the driver side door and demanded money,” the report in that case states. They gave him what their cash and cell phones, and he left on foot toward Cambronne Street, the report states.